The first Puget Sound Region Agricultural Drainage Conference will be held on Wednesday February 6th, from 8:30am-4:30pm at Allmendinger Hall on the WSU-Puyallup Campus: 2606 West Pioneer Ave, Puyallup WA 98371. Are you a Drainage District Commissioner? Do you work for a Conservation District, County Ag Program or Surface Water Management division, or a non-profit organization, and deal with agricultural drainage or water management issues? Do you live/work in the Puget Sound region? This conference is for you! The first Puget Sound Region Agricultural Drainage Conference, hosted by WSU’s Center for Sustaining Agriculture and Natural Resources, will be a day for staff and District Commissioners from regional organizations working on agricultural drainage issues to share challenges, solutions, lessons learned, and begin to set the stage for potential future collaborations, research efforts, or conversations. The day will feature interactive panels, relevant discussions, and ample time for networking and meeting folks working on similar issues. For FREE registration, please RSVP here. A working agenda is available here. *This conference is supported by the WSU Center for Sustaining Agriculture and Natural Resources (CSANR) and the USDA Sustainable Agriculture Research and Education program (SARE). This material is based upon work that is supported by the National Institute of Food and Agriculture, U.S. Department of Agriculture, under award number 2017-38640-26916 through the Western Sustainable Agriculture Research and Education program under subaward number 201207-511. USDA is an equal opportunity employer and service provider. Rawley, DD10 Commissioner, shows the depth of decomposing reed canarygrass in a roadside ditch. 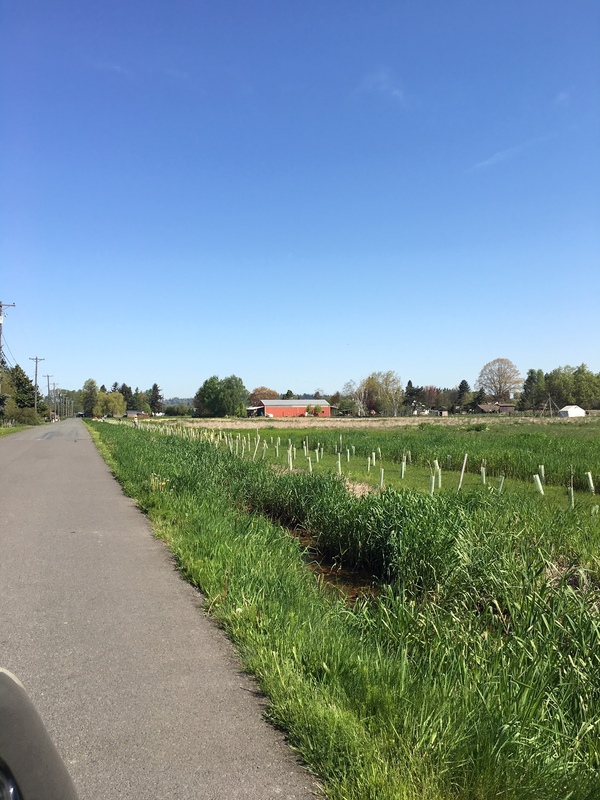 Pierce County Roads division has been expressing interest in understanding how better to support improved agricultural drainage by re-visiting their maintenance schedule and methods. Typically, their crew visits a few times a year, mows down the grass (mostly reed canarygrass or blackberries) and departs. However, this leaves piles of debris in ditches, which may eventually make their way to a culvert, and may only partially decompose, therefore blocking water from draining from the ditch. They’re now seeking a few locations to try out alternative methods, including cutting grass shorter, removing debris, and/or placing a mat down to block weed growth. They’re also open to conducting a survey of the ditch to remove high/low spots to improve flow! 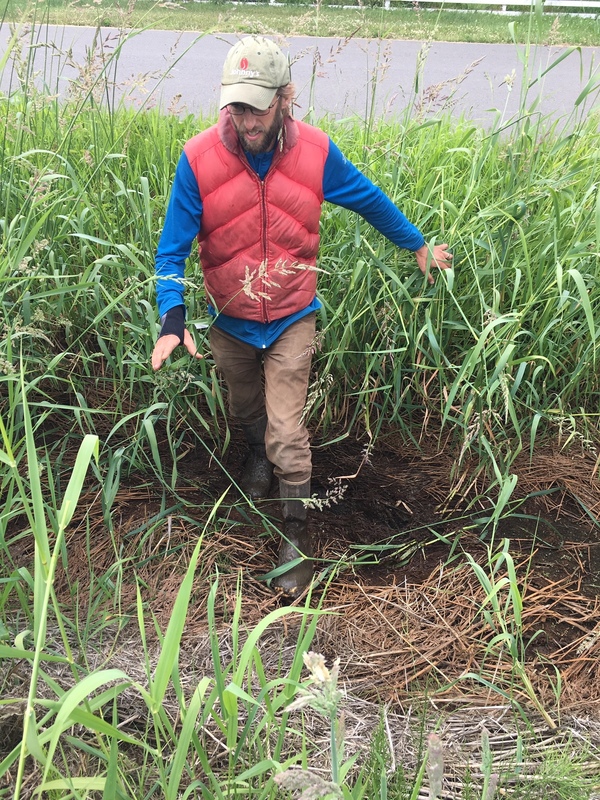 Let us know if you know of any ditches that drain agricultural fields AND are maintained by Pierce County Roads department, and we can connect you with the right folks! A roadside ditch filled with lush reed canarygrass. We’ll follow the progress and hope to see improvement in flow! The Farming in the Floodplain Project has officially moved to WSU in Puyallup. We’re affiliated with the Washington Stormwater Center and the Center for Sustaining Agriculture and Natural Resources. The Floodplains for the Future (FFTF) partnership- the group that received the first Floodplains by Design grants- continues to successfully collaborate, and received several recent large grants that will be used to further this work. Floodplains by Design funding will be arriving shortly, and the Farming in the Floodplain Project is planning for the next two years worth of work! Our work continues to be guided by the FFTF Agricultural Committee, comprised of staff from WSU-Puyallup, Forterra, PCC Farmland Trust, Pierce Conservation District, and Pierce County (Planning and Lands Services and Surface Water Management), as well as several local farmers/growers. Collaborate with Flood and Habitat Leads to co-design a project on 40-80 acres of SWM-owned property that will restore habitat and improve agricultural drainage. 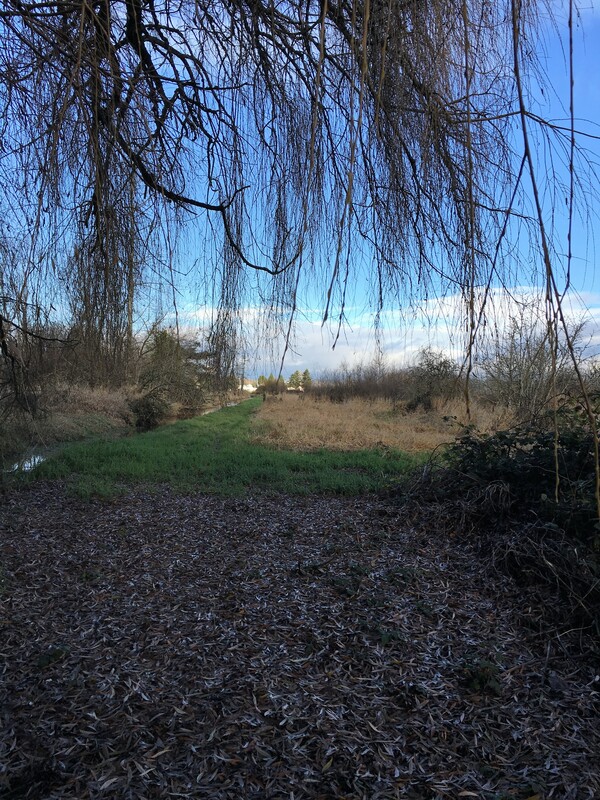 We are also continuing to collaborate with many partners to look at drainage problems within the Puyallup Watershed, and seeking options to support improved physical conditions and policies that will lead to improved agricultural drainage. To learn more about our work, email us! We’ve created six helpful and simple fact sheets to summarize the results and recommendations from our key reports and memos. These describe our research, what we found, and actions that can be taken to support agricultural viability in the Clear Creek area. Download our Fact Sheets below! A conservation easement is a voluntary legal agreement made between a landowner and a conservation nonprofit or government body. Agricultural conservation easements permanently protect farmland from future development while ensuring it remains available for agricultural production. 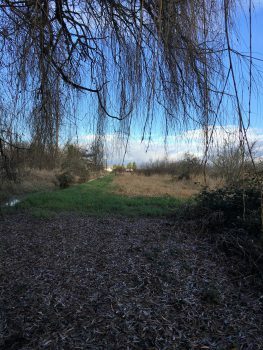 The easement does this by permanently removing development rights, prohibiting incompatible uses (industrial and commercial), and protecting the property’s agricultural values, including the soils, water rights, and open space. What allows conservation easements to exist? Washington State’s Conservation Easement Enabling Statuses (Washington Rev. Code 84.34.200 to 84.34.250) recognizes the public benefit in the preservation of open space and allows for the use and public funding of conservation easements to protect this public benefit. Because conservation easements involve private negotiations between a landowner and an easement holding entity, those negotiations are typically handled with care to protect any sensitive landowner information and respect privacy during negotiations. Many elements of the conservation easement process are public record however, including grant applications to public agencies for easement funding, finalized transactions and recorded acquisition documents, and public and educational events hosted on protected properties after closing. How much is a conservation easement worth? Who is compensated for an easement? The value of a conservation easement is determined by an appraisal, which considers the value of the property and its development rights according to the “highest and best use” of the property. The value of an agricultural conservation easement is the fair market value of the property minus its agricultural value, as determined by a qualified appraiser. In general, agreements that are more restrictive have a higher value. If the easement is being purchased by a land trust or government entity, the landowner is compensated cash through escrow for appraised value of the conservation easement. If the easement is being donated to a land trust, the appraised value of the conservation easement can be used as a basis for the landowner to claim income tax incentives on a charitable contribution. For more information on the tax incentives of donating a conservation easement, please see here. What is in a conservation easement? What is allowed and what is restricted? Each conservation easement involves negotiation with the landowner around certain provisions and restrictions that take into account the landowner’s long-term plan for their property. and opportunities for educational events (which are negotiated with landowners on a case-by-case basis and are not a requirement of the easement). Land Trusts, County Government, Conservation Districts or State and Federal Government can hold easements. Land Trusts and County Governments are the most common holders of easements. All easement holders work under the same base set of legal standards, public benefit requirements, private benefit prohibitions, and funding requirements. Conservation easement projects are prioritized by a number of factors. For agricultural conservation easements, most public funding sources agree on the key indicators of long-term agricultural value and viability – prime soils, water availability, on-site infrastructure, historical productivity, market access, proximity to other agricultural lands, and proximity to other protected open space, among others. In addition, projects are also prioritized by potential threat of conversion, as well as the general open space benefits (including water quality, wildlife habitat, and scenic views). In Pierce County, the members of the Strategic Conservation Partnership (SCP) partnered with the Pierce County Ag Roundtable to conduct a GIS-based prioritization of farmland protection opportunities in Pierce County; based on a set of farmland quality indicators (soils, location, etc.) and threat indicators (pending plats, proximity to urban growth boundaries). This prioritization is used by the SCP as a guide for landowner outreach and evaluation of farmland conservation opportunities in Pierce County. Where does funding for easements come from? Funding for easements primarily come from federal (USDA), state (RCO), and county grants. PCC Farmland Trust also raises and leverages private contributions to support our farmland protection work. A land trust or other conservation partner must undertake many steps before it can purchase an easement, including conducting a site assessment, securing of public funds, conducting acquisition and liability due diligence, and completing title review and baseline documentation. Because easements are primarily funded through public grants, which are available on either an annual or a biennial basis, it typically takes 2 years or more for a land trust or conservation partner to purchase an easement. Can a landowner sell a conserved property? What happens to the easement? Because easements are tied to the property and not the landowner, landowners can sell their conserved property and the property will continue to be protected by the conservation easement. Any future landowner is responsible for upholding the conservation easement. Can easements change after they’ve been agreed to? Easements are not meant to change over time. They are written to be perpetual legal agreements. There are enforcement and amendment processes described in the easement for situations when an easement needs to be amended. Anytime an easement is amended there needs to be a net conservation benefit from the amendment. An easement cannot be amended without agreement of the current landowner. What is the value of an easement when development is restricted by zoning, like in a floodplain? When valuing a conservation easement, an appraiser takes into account the development pressure and potential uses of a property. Depending on zoning, a limited amount of development may still be allowed, making a conservation easement hold some value. Typically greater development pressure will result in a higher easement value. What happens if conserved land isn’t farmed? Although PCC Farmland Trust places a strong emphasis on keeping farmland actively farmed, the public benefit test required of an easement is met by the land staying as “open space”. In general, requiring a landowner to keep a property in production is a sticky issue. Given the way that easements function legally, they are more effective as a tool to prohibit a certain activity, than to require a certain activity to happen. While it is difficult to require conserved land to be farmed, PCC Farmland Trust’s easement does incorporate a number of provisions to encourage continued agricultural use, including provisions requiring current use enrollment, maintenance of water rights and open fields, and limitations supporting long-term affordability.